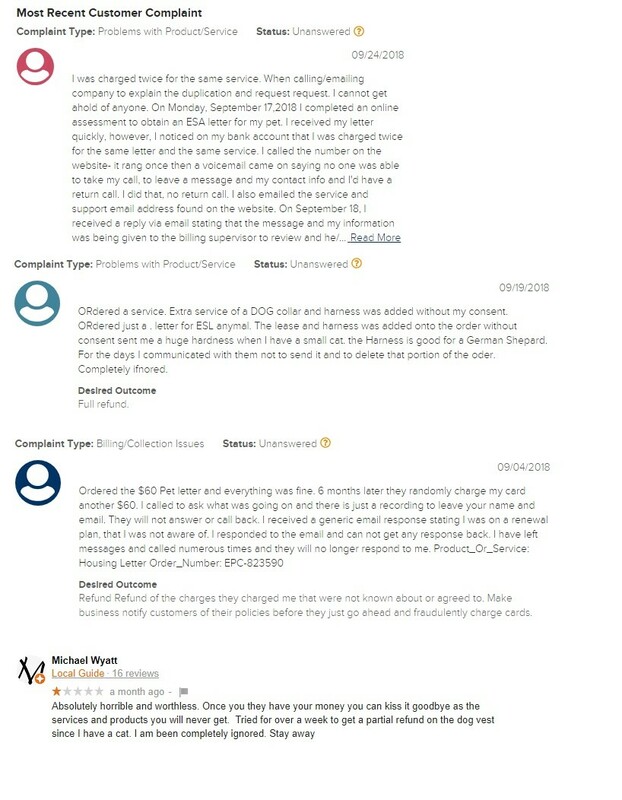 We wrote an ExpressPetCertify.com review for customers that have or are in contact with this company. A beloved animal can become much more than a pet. Our professional team at EzCare Medical Clinic knows that animals can become a form of therapy for those experiencing mental or emotional disorders such as depression, post-traumatic stress disorder, or generalized anxiety disorder. In these cases, it makes sense for a pet owner to get an ESA letter designating their companion as an emotional support animal. These letters allow them to keep their pet with them even in housing situations that don’t normally allow them and to fly with them in the cabin of airplanes, both with no added fees. These letters are very useful, but patients need to be aware that there are scam companies out there like ExpressPetCertify.com that provide letters that are not legitimate. Here’s what we know about this scam company and why you should avoid them. valid ESA letters cover both housing and travel. You can tell just from that statement that ExpressPetCertify.com is not a legitimate company providing ESA letters. EzCare Medical Clinic will only provide you with what you need: a valid ESA letter written by a licensed physician or mental health professional. ExpressPetCertify.com is not a legitimate company. In addition to the red flag mentioned above, the site also does not state that a licensed doctor or LMHP will talk to you during the process, which is necessary for the ESA letter to be valid. They only say that a therapist may ‘choose to review’ your application depending on the information you provide. Other red flags include a physical address that is not easily verified and a customer service phone number that is not answered. Companies that offer ESA letters must have a physical location where their physicians and LMHPs work. The fact that the address they list on their website does not exist is a huge red flag, but maybe one that is missed by the average customer as it takes some digging to realize it’s fake. The cost of the letters is also a tip-off. At $99, the cost suggests that they are not investing the time of a licensed physician or LMHP to qualify patients. At EZCare Medical Clinic, we charge $199 to cover the time of our licensed personnel who personally interview each customer before qualifying them. EzCare Clinic cares about all our valued patients and we want to make sure you get a valid ESA letter so you can keep your pet close to you at all times. All of our ESA letters are guaranteed and you will always speak to a licensed physician or LMHP during the qualification process. Knowing what to look out for to identify scams will help you avoid fraudulent sites and ensure that you get an ESA letter from a legitimate company like EzCare Medical Clinic.